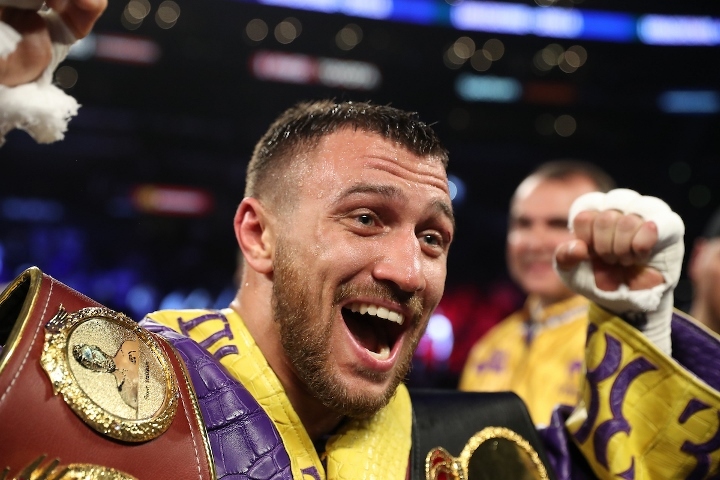 Vasiliy Lomachenko apologized for his English speaking skills after he knocked out Anthony Crolla with a right hand in the fourth round Friday to retain his WBO/WBA lightweight belts. There was no need to apologize. The pound-for-pound king, according to many, got his point across. Lomachenko didn’t need a translator for his witty one-liners during the postfight news conference. After being informed by a reporter that Crolla was down in the dumps because of the knockout loss, Lomachenko offered his condolences, sort of. “I’m so sorry,” said Lomachenko, drawing laughter from the crowd. Lomachenko’s comedy routine didn’t end there and it came at the expense of Teofimo Lopez. The Ukrainian fighter was then asked to rank who would be his most difficult opponents between Luke Campbell, Mikey Garcia and Lopez. “I think most harder it would be Campbell, second place Mikey, and second Mikey,” Lomachenko said with a grin. Obviously, Lomachenko didn’t forget about Lopez, but that could be his way of telling the brash 21-year-old he’s not ready for matchup with him. Lopez said he didn’t take offense to Lomachenko leaving him off the list. He wants to earn Lomachenko’s respect by winning a world title later this year. Lopez had a front row seat for Lomachenko’s dominant performance, but he was on his phone for the duration of the fight. Bob Arum, the promoter for Lopez and Lomachenko, said his ideal plan for 2019 would be for Lomachenko to fight Garcia in a unification bout and Lopez to challenge Richard Commey for the IBF belt. If the Top Rank fighters come out victorious, Arum wants a Lomachenko-Lopez bout for all the lightweight belts next year right after the Super Bowl. [QUOTE=Butch.McRae;19659129]Lopez beats Campbell whenever they fight, period. Let's not deflect here lol[/QUOTE] Maybe but it remains to be seen Lopez never fought someone top 50, Campbell did multiple times.